« Three Gates And Four Generators! The Fish Don’t Mind The High Water! Beautiful, sunny, warm day today…probably low 80s. Friday looks nice also with party cloudy and mid 80s. Possibility of scattered showers or thunderstorms in the afternoon. Saturday is our best chance for showers and/or thunderstorms. Some showers in the morning on Sunday, then cloudy most of the day. By Monday, it looks like low 80s and clear. Mid-week 50% chances of showers are currently showing up. No change in the water. Still have 10 flood gates and 3-4 generators almost 24 hours/day. Water is clear. the JQ and ruby 2 midge. 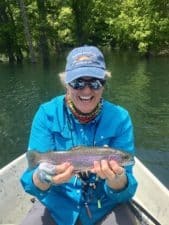 Joe is pretty new to fly fishing and did great in the extreme conditions of high water. worm dropper, or stripping the tiger tail. Stan had a couple of his regular, regulars, Gary and Bob out for their first half day. They had caught (and missed) a lot of fish on the lightning bug and stripping the holographic green crackleback. all day. They had a good day on the BH San Juan worm, a peach egg, and stripping the tiger tail. 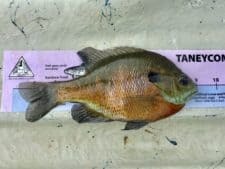 Gina took Wednesday Jim to a lake in Arkansas where they had an great day catching good size blue gill, Redear, green sunfish and long ear or pumpkinseed. 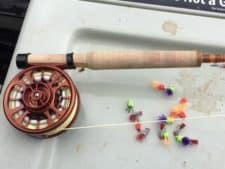 They used lots of different size 10, 1/100th jigs in various bright colors. They were ready for some nice, calm water for a change. 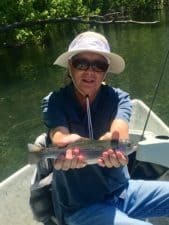 This entry was posted on Thursday, May 25th, 2017 at 12:54 pm	and is filed under Fishing Reports. You can follow any responses to this entry through the RSS 2.0 feed. You can leave a response, or trackback from your own site.